So you tried Arduino programming. 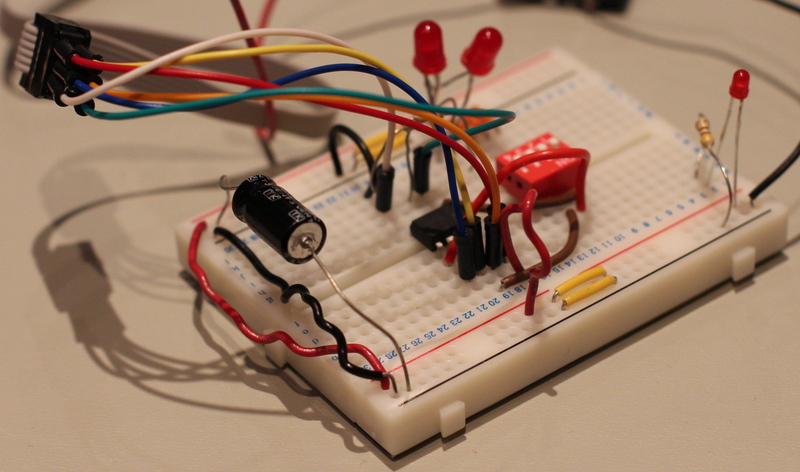 It is a great way to get introduced to Microcontrollers. But if you are actually an experienced programmer it doesn’t quite feel like the real thing. It is sort of like learning BASIC when you know there is this other thing real programmers use which is C.
Arduino is built around the AVR microcontroller. It simplifies a lot by providing a USB port on the board itself and having a loaded program to load your program into the memory of the AVR microcontroller. If you want to program an AVR chip directly without having all the Arduino infrastructure, then you need a piece of hardware called a programmer and software such as AVRdude. The problem getting started with this is that the information related to it is scattered all around the internet. This is my attempt to collect it all in one guide. First get CrossPack. It is a collection of tools for programming AVR chips on OS X. The most important part being AVRDUDE. The next thing you need to do is bookmark AVR fuse calculator. When programming AVR there are something called fuse bits. There are bits which you store in flash memory which affect how the AVR chip will work. It is important to not screw up these settings because if you do it wrong you might not be able to program it again. The fuse bits can be used to set the way the AVR chip should be programmed. When developing electronics projects I prefer to have the important data sheets printed out. So I recommend printing out the ATtiny13 datasheet found at atmel.com. And if you like me use the AVR-ISP500 programmer from Olimex get its manual. Now I am not going to repeat all the great information found in all these data sheets and manual, but I will try to fill in the blanks. Connecting all this information to get you to program your AVR chip is not always straight forward. To get a list over supported AVR chips, or parts as AVRDUDE will refer to them. But really the easiest way to write the DEVICE name is to just write the name of the chip is small letters. So ATtiny13 becomes attiny13. I actually have a ATtiny13V, but you should not add the V. It is not really a significantly different model. The next problem is specifying the programmer. This can be confusing. You do not actually write AVR-ISP500, even though that is what you have. What matters is the protocol. The AVR-ISP500 uses the STK500v2 protocol, so that is what matters to AVRDUDE. This is probably because mutliple manufactureres probably make programmers which act the same, but they need to be given unqiue names to distinguish each product. to get a list of serial devices. Unfortunatly our serial device is not there. That is because it is logical and created on the fly. So you have to actually plug in your AVR-ISP500 into the USB port before it pops up in the list. The name will be different for different computers. On my computer it shows up as /dev/cu.usbmodemfa121. Now we got the software configured. What is left is getting the hardware configured. Before going into details, let me just tell you that hooking up the programmer to your AVR chip is a lot easier than I thought at first. You do not really need to put in any extra components: capacitors, resistors etc. You do not even need to supply a power source. The programmer will give you everything including power through its cable. Target VCC is the same as VCC on your AVR chip. This is how the chip gets power. Target reset connects to pin 1 on your ATtiny, which is the reset pin. When it goes LOW it will reset the chip. E.g. starting program over again. Ground (GND). Connect to pin 4, which is GND on the AVR. 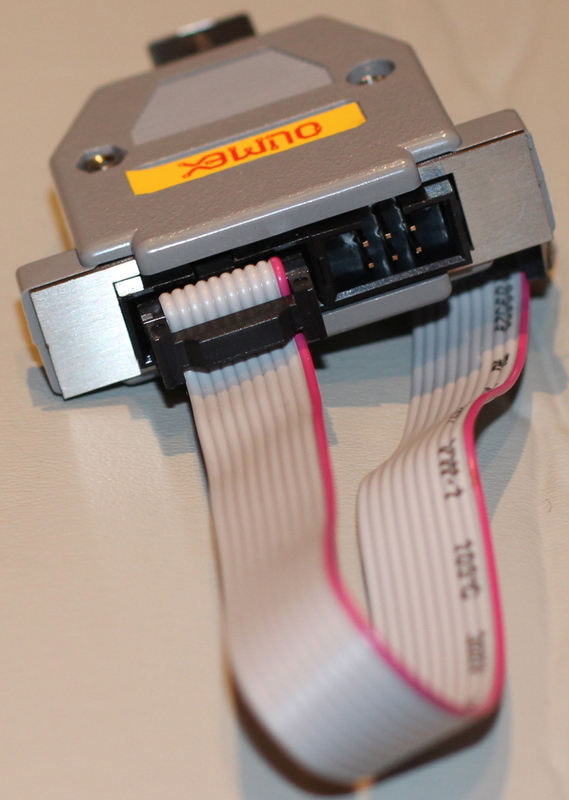 The Olimex AVR-ISP500 manual shows pictures of the connectors to help you identify where the individual pins are. 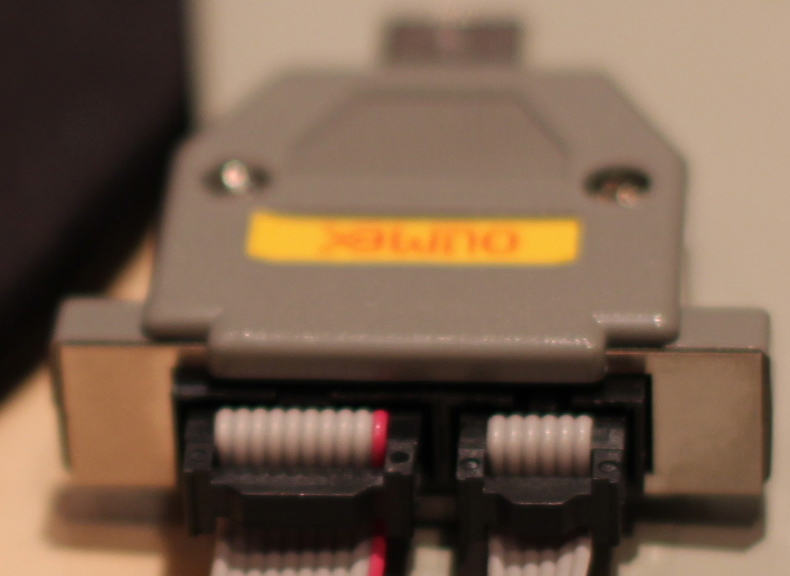 I am using narrow cable with 6 pins on the right side on the image below. If you pull out the cable it is easy to compare with the Olimex manual. A thing to note about the cable is the pins get turn upside down. 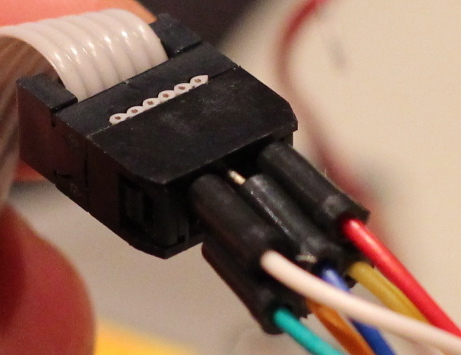 So if you turn the programmer so that pin 1 is at the lower left as shown in the manual, it will be the upper left at the end of the cable. In the picture below I have turned the plug so that the the red cable is actually pin 2 and the yellow cable below is pin 1. If in doubt measure resistance with your multi meter at both ends, to make sure you are not mixing up which pin is which. If you guessed right, there should be approximatly zero resistance measured. Below you can see how I connected all the pins from the programmer to the chip. This is the simple project from chapter 1 of the Evil Genius book. But the important thing here is how the cables are connected from the programmer to the ATtiny13 chip, because that is all you need. You do not need the LEDs, buttons, resitors and capacitor I put in. Simple setup from Evil Genius book. Allows us to turn on toggle to LEDs with push buttons.